Postpartum depression (PPD) is a common potentially disabling condition which can even be life-threatening in some cases. PPD prevalence in Iran is about 25%. It occurs in the first 4 weeks after delivery. PPD signs and symptoms include depressed mood, fatigue, anxiety, irritability, insomnia, loss of interest and pleasure, inability to care for the infant, and in some extreme cases, obsessive behaviors and thoughts of harming oneself or the infant. PPD can also deteriorate mother–infant relationship, and affect all aspects of mother's life, including her social activities, personal functioning, and housekeeping ability. It also puts mothers at risk for experiencing depressive episodes or developing depressive disorders later in life. Many biological and environmental factors can contribute to PPD development. For instance, unhealthy lifestyle habits, cesarean section, breastfeeding problems, prenatal hospitalization, and labor complications can increase the risk for PPD. Despite the availability of effective pharmacological treatments for PPD, most afflicted mothers are reluctant to seek help and refuse to receive treatments due to their side effects. Accordingly, complementary therapies, which have fewer side effects, can be useful for them. This study aimed to investigate the effects of infant massage by mother on maternal PPD. This clinical trial was conducted on primiparous mothers from March 1 to September 31, 2010. Inclusion criteria were an age of 18–45 weeks, singleton pregnancy with a gestational age of 37–42 weeks, normal vaginal delivery, definite diagnosis of PPD (as determined by a score of 10 or more for the Edinburgh Postnatal Depression Scale [EPDS]), no affliction by physical or mental health problems, and an infant's age of 2 weeks or more. Mothers were included if they lived with their infants and their infants suffered from no obvious congenital malformations. We excluded mothers who used any kind of herbal or pharmacological therapies for PPD, missed two consecutive infant massage sessions, or chose to live separately from their infants during the study. Mothers in the control group were also excluded if they gave any kind of massage to their infants. Participants were recruited using cluster sampling. First, three health-care centers were randomly recruited from all nine health-care centers located in Shahrekord, Iran. Then, sixty mothers were recruited from each selected center. Mothers were invited and recruited to the study at their first postnatal attendance at health-care centers for the routine 2-week postnatal visit. Participants were randomly allocated either to a control or an intervention group. A computerized method was used to generate a random sequence for random allocation. For sample size calculation, Type I error and power were set at 0.05 and 0.2, respectively. Moreover, the results of our pilot study indicated that the mean scores of PPD in the control and the intervention groups were 9.02 ± 4.95 and 7.01 ± 6.32, respectively. Accordingly, 126 mothers were estimated to be needed – 63 for each group. However, considering the possible attrition, we decided to recruit 90 participants in each group. Then, among 270 eligible mothers in the study setting, 180 were randomly recruited and allocated to the intervention (n = 90) and the control (n = 90) groups. The main outcome of the study was maternal PPD score. It was measured 1 day before and 1 day after the intervention in the public health centers through EPDS. This scale contains 10 items, each is rated on a four-point 0–4 scale. Therefore, EPDS total score ranges from 0 to 40 with higher scores showing more serious PPD. A demographic questionnaire was also employed to collect data. The items of the demographic questionnaire were on infant's gender, parents' educational and employment status, and family income. The intervention was infant massage which was provided by mothers in the intervention group to their infants. The massage protocol was the same as the protocol published by Field, except that its kinesthetic stimulation component was removed because an earlier study found that infants who received tactile-kinesthetic stimulation showed a higher level of stress behaviors. Such modification was made by a certified pediatric physical therapist. Initially, all mothers in the intervention group watched a 15-min massage therapy provided to an infant by the first author in the 1st day of the intervention. Then, they were provided with infant massage instructions 2-week postnatal. After that, each mother independently exercised infant massage under the supervision of the first author. Finally, all mothers were required to provide 15-min infant massage at home twice daily (both in the morning and the afternoon) from the 2nd day of the intervention for 6 consecutive weeks. Mothers were also given an instructional CD and booklet which showed infant massage step-by-step and contained information about its potential effects. Moreover, the first author made weekly telephone or face-to-face contacts with each participant to ensure the accurate implementation of infant massage, check whether they breastfed their infants, and prevent the contamination of mothers in the control group with instructions provided to their counterparts in the intervention group. All mothers could also make telephone contacts with the first author whenever needed. The study was approved by the Institutional Review Board and the Ethics Committee of Tehran University of Medical Sciences, Tehran, Iran (code: 89046110410). The study was also registered at Iranian Registry for Clinical Trials (IRCT code: IRCT201102265912N1). Informed consent was obtained from each mother and they were assured of data confidentiality. The research team committed to protect participants' rights according to the Declaration of Helsinki. The data were analyzed using the SPSS software v. 16.0 (IBM Corp., Armonk, NY, USA). Categorical variables were described using absolute and relative frequencies, while numerical variables were described using mean and standard deviation. Normality assumption was tested through the Kolmogorov–Smirnov test. Then, the groups were compared with each other respecting participants' demographic characteristics through the Chi-square test and the independent-samples t-test. The paired-samples t-test and the Wilcoxon signed-rank test were conducted for within-group comparisons in terms of the mean scores of PPD. Besides, the independent-samples t-test was conducted for between-group comparisons respecting the pre- and posttest mean scores of PPD. The score 10 was considered as the cutoff point of EPDS so that mothers with scores 10 and less were considered depressed and those with scores >10 were considered nondepressed. Subsequently, the Chi-square test was used for comparing the groups with respect to PPD prevalence. Univariate logistic regression analysis was also performed to estimate the effects of each variable on depression. Variables with P < 0.3 in univariate analysis were entered in multivariable logistic regression, and odds ratio (OR) with 95% confidence interval was calculated. The goodness of fit for the logistic regression model was assessed through Hosmer–Lemeshow test. The level of significance in all tests was set at <0.05. Among the 180 participants, 30 were excluded from each group (an attrition rate of 39%) and 60 in each group completed the study [Figure 1]. On average, mothers in the intervention and the control groups aged 27.7 ± 4.02 and 26.58 ± 4.46, respectively. Most infants of the mothers in the intervention group were male (55%), while most infants of the mothers in the control group were female (63.3%). Study groups did not significantly differ from each other concerning parents' and infants' demographic characteristics (P > 0.05), except for infants' gender [P = 0.05; [Table 1]. The pretest mean scores of PPD in the intervention and control groups were not significantly different (P = 0.46). As presented in [Table 2], after the intervention, the mean score of PPD in the intervention group significantly decreased to 7.75 ± 2.18 (P < 0.001), while its decrease in the control group to 9.20 ± 2.04 was not statistically significant (P = 0.06). The amount of decrease in the intervention group was significantly greater than the control group (−3.77 ± 2.74 vs. −2.11 ± 1.66; P < 0.001). The relative frequency of PPD after the intervention was significantly lower in the intervention group than the control group (15.60 [25%] vs. 26.60 [43.3%]; χ2 = 4.48; P = 0.034). Logistic regression analysis revealed that after controlling the effects of other variables, the odds of PPD in the intervention group was 0.5 times less than the control group [OR = 0.50; P = 0.003; [Table 3]. However, the odds of PPD among older mothers and the mothers of female infants was not significantly different from the odds of PPD among, respectively, younger mothers and the mothers of male infants. 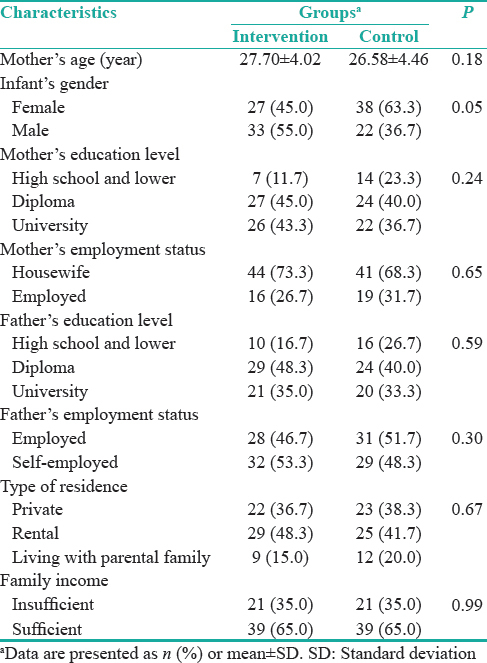 Moreover, the odds of PPD was not significantly associated with mothers' educational status [Table 3]. The Hosmer–Lemeshow test statistics was equal to 3.74, indicating a decent fit for the logistic regression model. Studies showed that PPD will not improve unless mother–infant interaction gets better. Mother–infant interaction during massage can have positive physiological and psychological effects on mothers. Previous studies also showed that infant massage by mothers or other methods of infant–mother skin contact can significantly alleviate PPD, improve mother–infant attachment and interaction, reduce maternal anxiety,,, enhance parenting skills, alleviate parents' stress, promote parent–infant interactions, and improve mother's satisfaction. Early interventions targeting parent–infant relationships have also positive effects on maternal mental health and can alleviate maternal posttraumatic stress symptoms., The beneficial effects of infant massage on mothers can be attributed to its physiological effects such as increases in the levels of mothers' blood cortisol and oxytocin. Higher levels of cortisol are a risk for subsequent depression. However, a study showed that although infant massage positively affected mother's mood status, it did not significantly change mother's salivary cortisol level. Similarly, another study reported the insignificant effects of maternal attachment on depressive symptoms. One limitation of this study was that we established PPD diagnosis only using EPDS and did not consult a psychologist to confirm the diagnosis. Infant massage significantly alleviates maternal PPD. Given the easy applicability and cost-effectiveness of infant massage, health-care professionals, particularly midwives, are highly recommended to instruct mothers to provide infant massage in order to alleviate their PPD. Future studies into the effects of infant massage on maternal PPD are recommended to assess PPD not only through questionnaires but also through clinical interviews by psychologists. Another area of study would be the investigation of the effects of infant massage on infant's behaviors such as crying, sleep, and colic as well as maternal satisfaction with infant's behaviors. The authors would like to profusely thank the mothers who participated in this study. We also would like to thank the reviewers of the Journal of Nursing and Midwifery Studies for their valuable comments on this manuscript. Iliadis SI, Skalkidou A, Ranstrand H, Georgakis MK, Axfors C, Papadopoulos FC, et al. Self-harm thoughts postpartum as a marker for long-term morbidity. Front Public Health 2018;6:34. Veisani Y, Delpisheh A, Sayehmiri K, Rezaeian S. Trends of postpartum depression in Iran: A systematic review and meta-analysis. Depress Res Treat 2013;2013:291029. American Psychiatric Association. Diagnostic and Statistical Manual of Mental Disorders-IV-TR. Washington, DC: American Psychiatric Association; 2000. Hoffman C, Dunn DM, Njoroge WF. Impact of postpartum mental illness upon infant development. Curr Psychiatry Rep 2017;19:100. Darcy JM, Grzywacz JG, Stephens RL, Leng I, Clinch CR, Arcury TA, et al. Maternal depressive symptomatology: 16-month follow-up of infant and maternal health-related quality of life. J Am Board Fam Med 2011;24:249-57. Ohoka H, Koide T, Goto S, Murase S, Kanai A, Masuda T, et al. Effects of maternal depressive symptomatology during pregnancy and the postpartum period on infant-mother attachment. Psychiatry Clin Neurosci 2014;68:631-9. Posmontier B. Functional status outcomes in mothers with and without postpartum depression. J Midwifery Womens Health 2008;53:310-8. Woolhouse H, Gartland D, Mensah F, Giallo R, Brown S. Maternal depression from pregnancy to 4 years postpartum and emotional/behavioural difficulties in children: Results from a prospective pregnancy cohort study. Arch Womens Ment Health 2016;19:141-51. Ghaedrahmati M, Kazemi A, Kheirabadi G, Ebrahimi A, Bahrami M. Postpartum depression risk factors: A narrative review. J Educ Health Promot 2017;6:60. Callister LC, Beckstrand RL, Corbett C. Postpartum depression and help-seeking behaviors in immigrant Hispanic women. J Obstet Gynecol Neonatal Nurs 2011;40:440-9. Vicente S, Veríssimo M, Diniz E. Infant massage improves attitudes toward childbearing, maternal satisfaction and pleasure in parenting. Infant Behav Dev 2017;49:114-9. Asadollahi M, Jabraeili M, Mahallei M, Asgari Jafarabadi M, Ebrahimi S. Effects of gentle human touch and field massage on urine cortisol level in premature infants: A randomized, controlled clinical trial. J Caring Sci 2016;5:187-94. Porter LS, Porter BO, McCoy V, Bango-Sanchez V, Kissel B, Williams M, et al. Blended infant massage-parenting enhancement program on recovering substance-abusing mothers' parenting stress, self-esteem, depression, maternal attachment, and mother-infant interaction. Asian Nurs Res 2015;9:318-27. Onozawa K, Glover V, Adams D, Modi N, Kumar RC. Infant massage improves mother-infant interaction for mothers with postnatal depression. J Affect Disord 2001;63:201-7. Ahn HY, Lee J, Shin HJ. Kangaroo care on premature infant growth and maternal attachment and post-partum depression in South Korea. J Trop Pediatr 2010;56:342-4. Montazeri A, Torkan B, Omidvari S. The edinburgh postnatal depression scale (EPDS): Translation and validation study of the iranian version. BMC Psychiatry 2007;7:11. Field T. Preterm newborn pain research review. Infant Behav Dev 2017;49:141-50. Aliabadi F, Askary RK. Effects of tactile-kinesthetic stimulation on low birth weight neonates. Iran J Pediatr 2013;23:289-94. Badiee Z, Faramarzi S, MiriZadeh T. The effect of kangaroo mother care on mental health of mothers with low birth weight infants. Adv Biomed Res 2014;3:214. Fujita M, Endoh Y, Saimon N, Yamaguchi S. Effect of massaging babies on mothers: Pilot study on the changes in mood states and salivary cortisol level. Complement Ther Clin Pract 2006;12:181-5. McClure VS. Infant massage: A handbook for loving parents. New York: Bantam; 2017. O'Higgins M, St. James Roberts I, Glover V. Postnatal depression and mother and infant outcomes after infant massage. J Affect Disord 2008;109:189-92. Field T. Postpartum depression effects on early interactions, parenting, and safety practices: A review. Infant Behav Dev 2010;33:1-6. Gürol A, Polat S. The effects of baby massage on attachment between mother and their infants. Asian Nurs Res 2012;6:35-41. Cheng CD, Volk AA, Marini ZA. Supporting fathering through infant massage. J Perinat Educ 2011;20:200-9. Livingston K, Beider S, Kant AJ, Gallardo CC, Joseph MH, Gold JI, et al. Touch and massage for medically fragile infants. Evid Based Complement Alternat Med 2009;6:473-82. Borghini A, Habersaat S, Forcada-Guex M, Nessi J, Pierrehumbert B, Ansermet F, et al. Effects of an early intervention on maternal post-traumatic stress symptoms and the quality of mother-infant interaction: The case of preterm birth. Infant Behav Dev 2014;37:624-31. Ravn IH, Smith L, Smeby NA, Kynoe NM, Sandvik L, Bunch EH, et al. 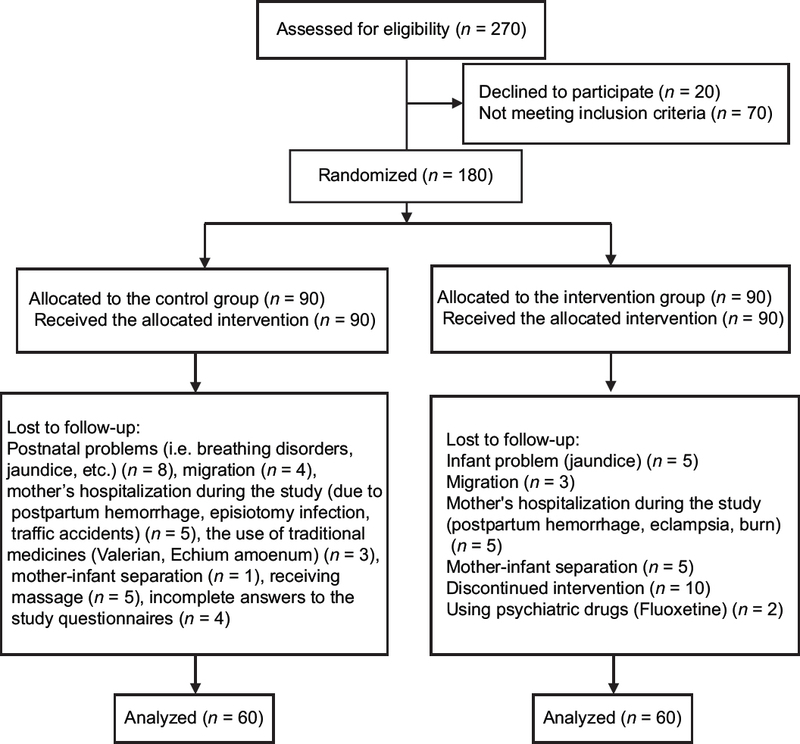 Effects of early mother-infant intervention on outcomes in mothers and moderately and late preterm infants at age 1 year: A randomized controlled trial. Infant Behav Dev 2012;35:36-47. Field T. Touch for socioemotional and physical well-being: A review. Dev Rev 2010;30:367-83. Herbert J. Cortisol and depression: Three questions for psychiatry. Psychol Med 2013;43:449-69.